This post is part of a paid partnership with Bounty. The content and opinions expressed are all mine. One day I'll get my mom to sign off on oyster dressing for the holidays. It wasn't this year, or last year, or even the year before. My grandmother (her mom) used to prepare the most amazing clam and linguiça sausage dressing for Thanksgiving every year, so the problem isn't the inclusion of seafood. But at the mere mention of "oysters" my mom just shudders. Sadly it's a no, for now at least. Until then, my way of getting what I want is to put it in an appetizer. 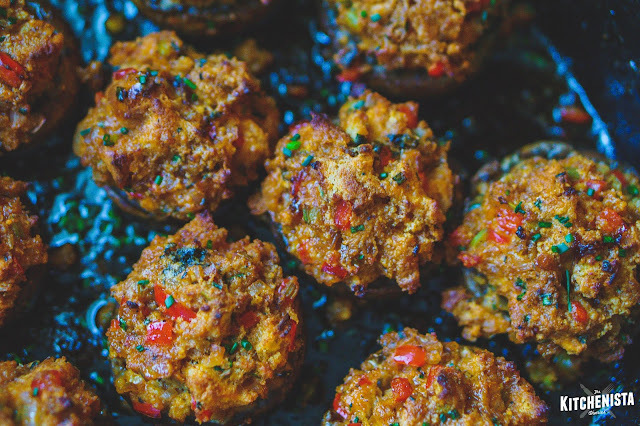 Large white mushrooms are perfect for stuffing with just about anything. In this case the oyster dressing I don't get to serve as a side dish becomes the perfect holiday starter. I prepare the "regular" cornbread dressing for dinner, then use leftover ingredients the next day to get a taste of what I really wanted. Everybody wins. The one thing my mom and I do agree on? That Bounty paper towels are a necessity in this house. She appreciates that Bounty gets the kitchen restored back to pristine condition after my culinary escapades, and I rely on the versatility of durable paper towels as a tool for my cooking tasks. I used to get a little stressed trying to follow recipes for dressing, but the truth is, there's no singular way to do things. Use my notes below as guidelines to improvise with the food you have on hand. 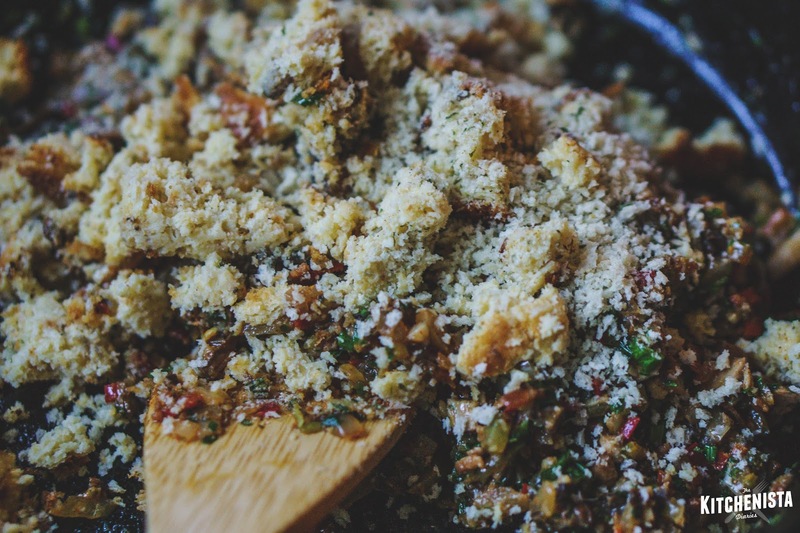 Crumbled cornbread makes up the bulk of the dressing, but the texture is improved by including a couple slices of white bread or panko crumbs. Crushed crackers would probably also do the trick in a pinch. If you can't get your hands on fresh shucked oysters, smoked oysters are a tasty and economical substitution. They're also probably a better choice for folks who are on the fence about the briny flavor of fresh oysters, though I love both versions equally. Bacon adds some depth and a touch of additional smokiness, but it's not a deal breaker to leave the pork out. To go with the Cajun flavor profile, I used a classic combination of onions, celery and bell pepper (the "trinity), and it also worked well to replace the bell pepper with spicier Fresno chili peppers for extra heat. Just don't skimp on the herbs! Fresh herbs are a must all year round, but they're especially critical to bringing holiday recipes to life. A hack I use to keep sturdier herbs like parsley, rosemary and thyme fresher longer, is to wrap them loosely in a slightly damp sheet of Bounty, as it really helps lock in moisture better. 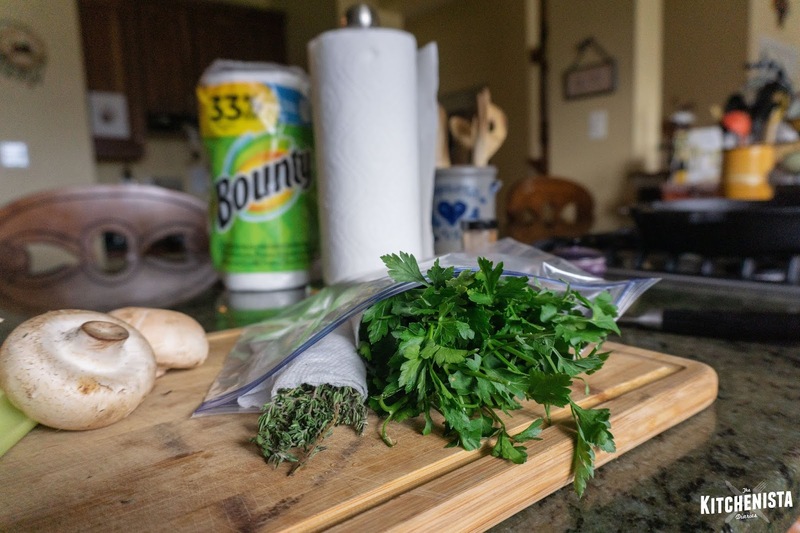 Store the wrapped herbs in plastic zip bags in the fridge. 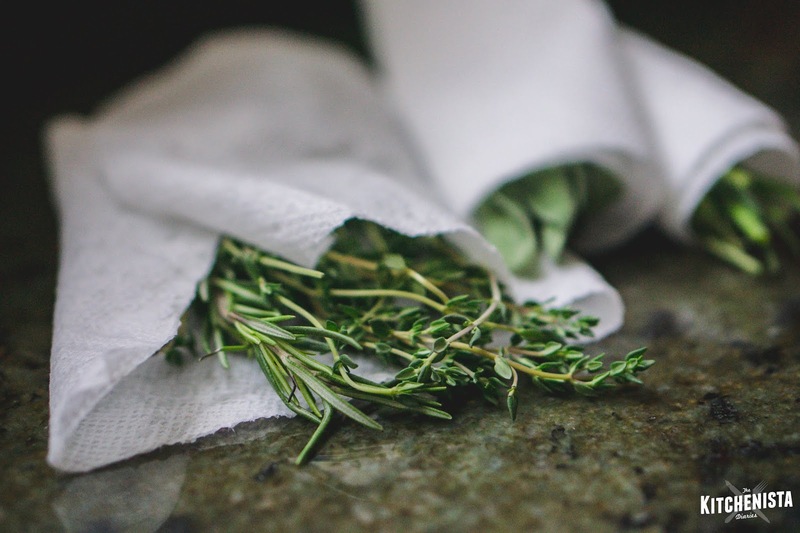 No more having to toss out brown, dried out herbs every week that you never got to use. Though there's a little bit of prep involved in preparing stuffed mushrooms, it's offset by the ease of doing everything in one large oven-safe skillet. I prefer to use my 12" cast iron skillet here. You can also assemble the mushrooms, refrigerate, and bake up to a day later. 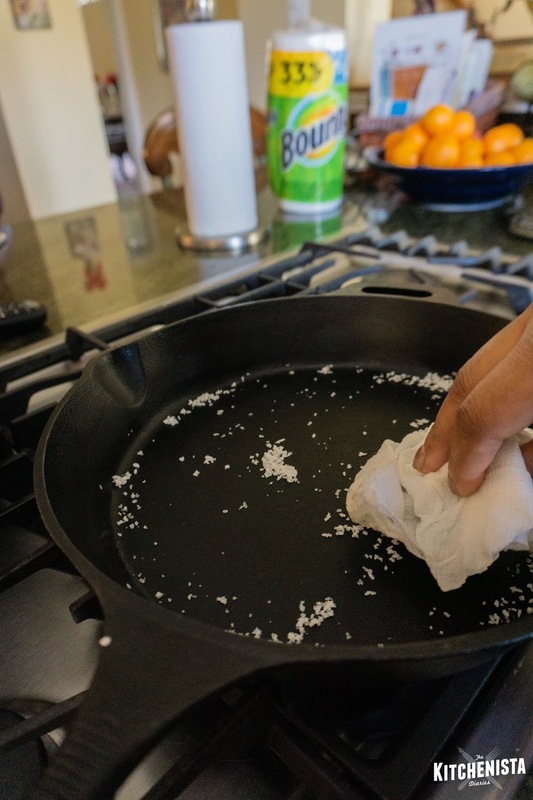 *A salt-free seasoning blend is best, to control the sodium in your recipe. 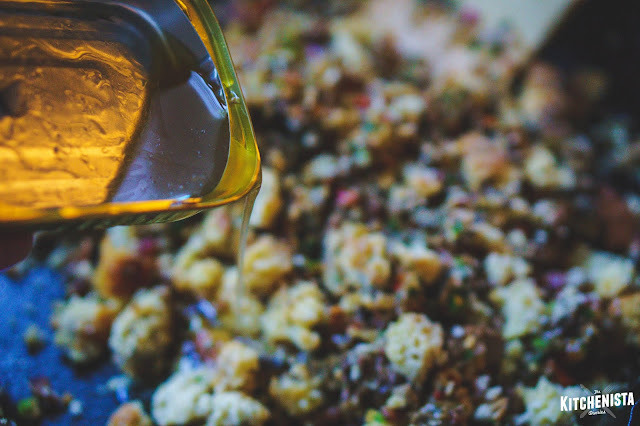 If your spice mix already includes salt, be careful adding additional salt to the dressing. In a large oven-safe skillet, cook the bacon pieces over medium heat until crisp. 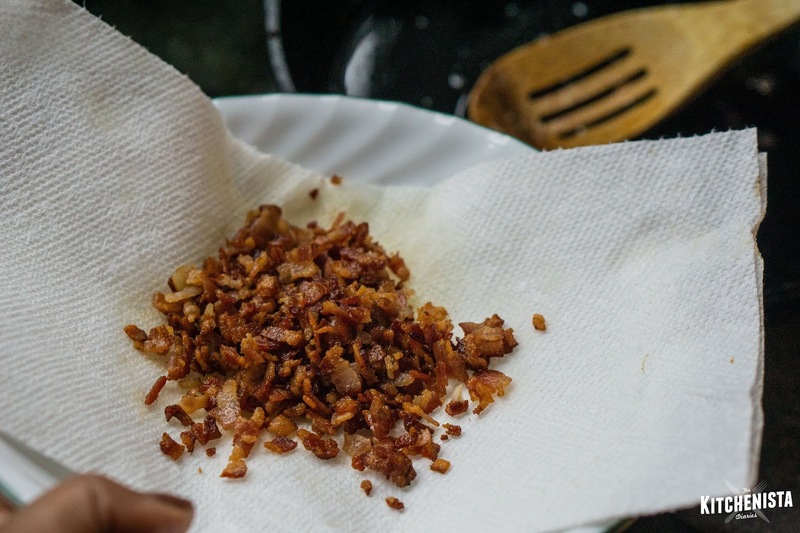 Transfer the cooked bacon crumbles to a plate lined with a Bounty sheet. 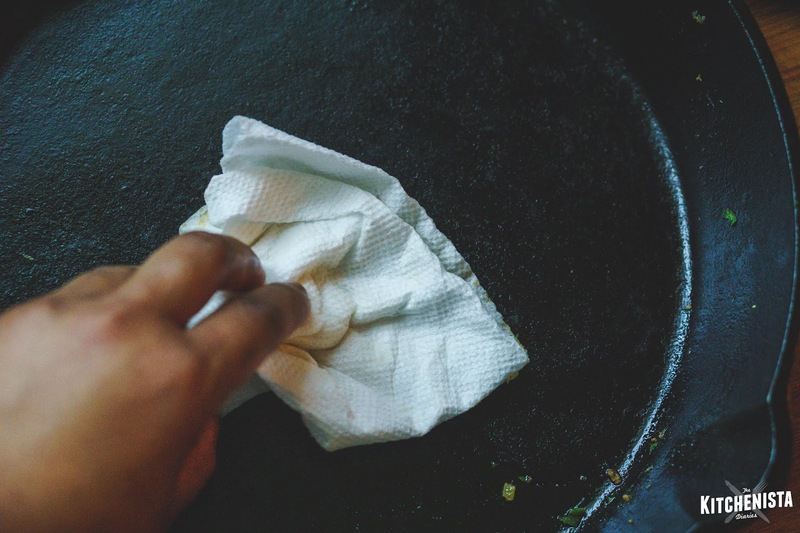 A single sheet is absorbent enough to soak up excess grease, so there's no need to waste half a roll here. Any bacon fat left in the skillet can be used to cook the vegetables later. While the bacon cooks, prep your mushrooms. I always use a damp sheet of Bounty to brush off any debris on mushrooms. 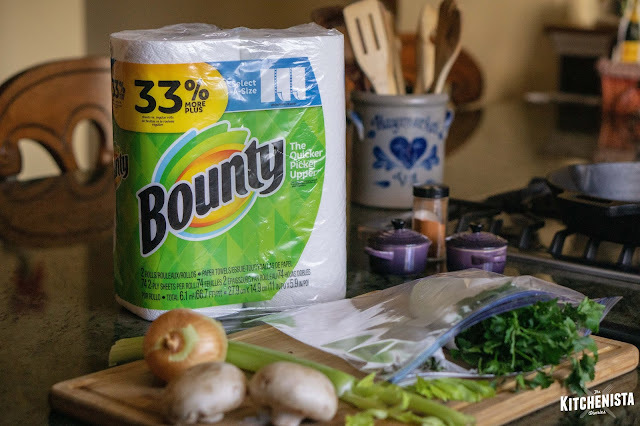 One thing I love about Bounty is that they are strong enough to wet with water and squeeze out like a rag, without tearing, and reuse again - have you seen another paper towel do that?! 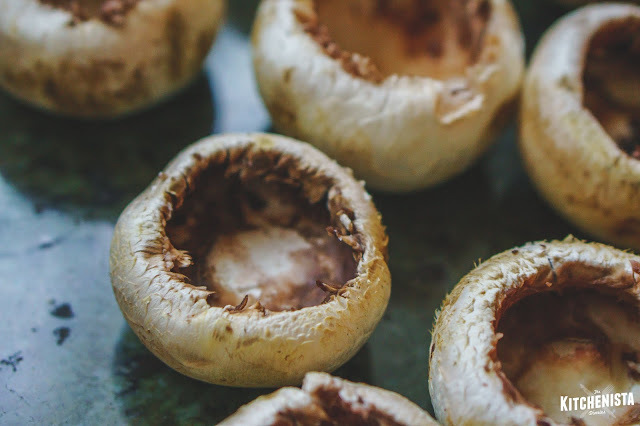 If your mushrooms are caked with dirt, by all means give them a quick rinse first, just don't allow mushrooms to hang out too long in water as they'll soak it up like a sponge. Scrape out the stems and as much as the dark brown gills as you can without breaking the mushroom caps. You can freeze the stems to add to stocks or soups another day. Back to the skillet. If you have less than a couple tablespoons of bacon fat in the skillet, add a pat of butter. Saute the onions, celery and pepper just until softened. Stir in the garlic, and if using, crushed red pepper. (You may not want to add hot peppers if you're already using a chili pepper, and/or have a spicy Cajun seasoning blend.) Season the mixture generously with your Cajun rub and salt, to taste. 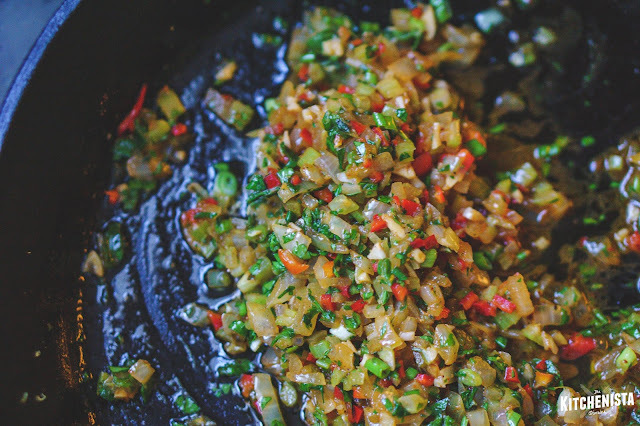 Stir in the chopped herbs and scallions. Turn off the heat and allow the mixture to cool as you prep the next ingredients. Whether you're using fresh or smoked oysters, the oysters need to be chopped up. For fresh oysters, the key is not losing all that precious oyster liquor all over your counter. 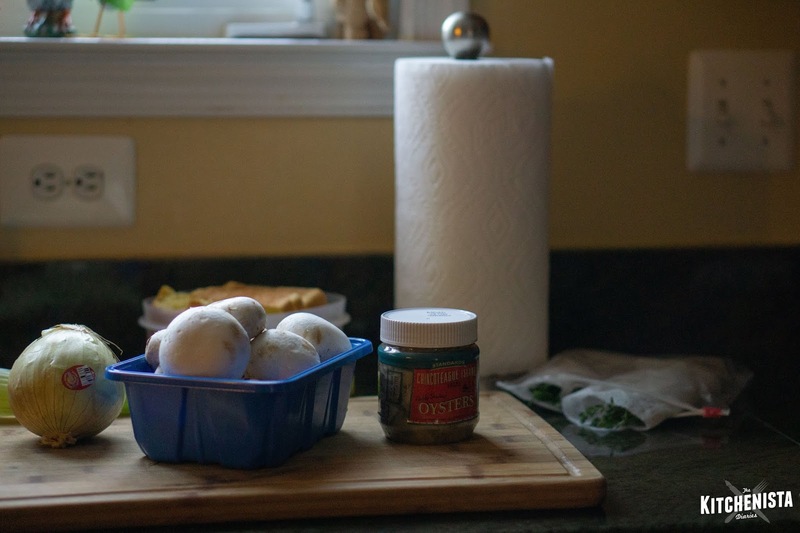 In my original quest to research oyster dressing recipes, I picked up a tip from Serious Eats to cut up the oysters in (or over) the container using poultry shears. Though there will still be some liquid in a tin of smoked oysters, it's not as wet. It worked fine to chop these up on a cutting board, reserving the liquid in the tin. 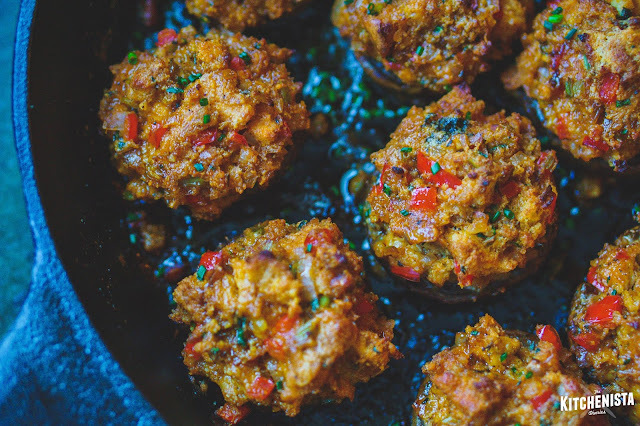 Regardless of the type of oysters you use, once they're chopped up, stir them into the skillet with the cooked veggies. (Just the oysters. Reserve any liquor or liquid from the containers, to moisten the dressing at the end.) Double check seasoning, adding a pinch of salt and/or Cajun spices if needed. Stir in the egg, lightly beaten. Then add the crumbled cornbread and bread crumbs. Finally, add some of the reserved oyster liquor to moisten the oyster dressing. Just enough that it will hold together if pressed gently into a spoon. Because the mushrooms give up so much excess liquid, you don't need to make the dressing too wet. Stir in the cooked bacon. Transfer the dressing to a bowl and set aside. 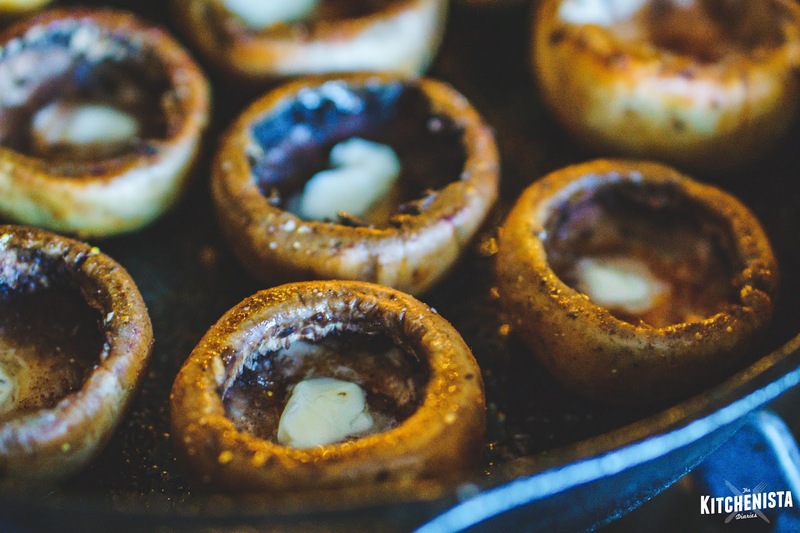 You can bake the mushrooms right in the same skillet, so just wipe it clean. A damp paper towel does the trick here too. Even against rougher surfaces, Bounty holds up without leaving bits of paper behind. I mean look at how the sheets are woven! Melt a tablespoon of butter in the skillet over low heat. Add a pinch of Cajun spice and swirl the butter around to grease the skillet. Turn off the heat. Place the mushroom caps in the skillet. Dot the inside of each cavity with a tiny bit of butter. 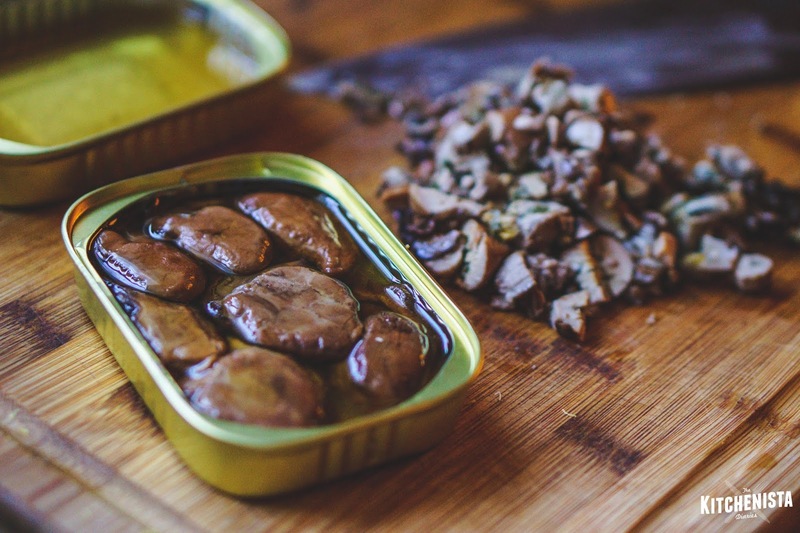 Sprinkle the mushrooms with salt. Note: If you don't have an oven-safe skillet, just lightly grease a casserole dish instead. Heat your oven to 350°F. 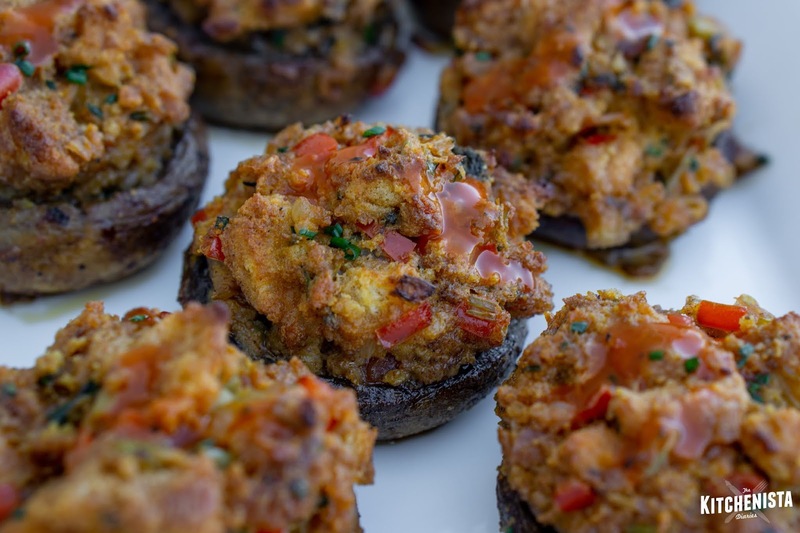 Bake the stuffed mushrooms for 15 to 20 minutes, until tops are golden brown. Allow them to cool for a few minutes, then carefully transfer to a serving platter. Drizzle with hot sauce and enjoy! One last thing. Here’s a little tip on how to clean that cast iron skillet, because we could all use more kitchen hacks: Pour a cup of coarse Kosher salt into your (still warm) skillet, and scrub off any stuck-on food with a Bounty sheet. Next, rinse the pan with hot water. After rinsing, place a sheet of Bounty inside the cast iron skillet. 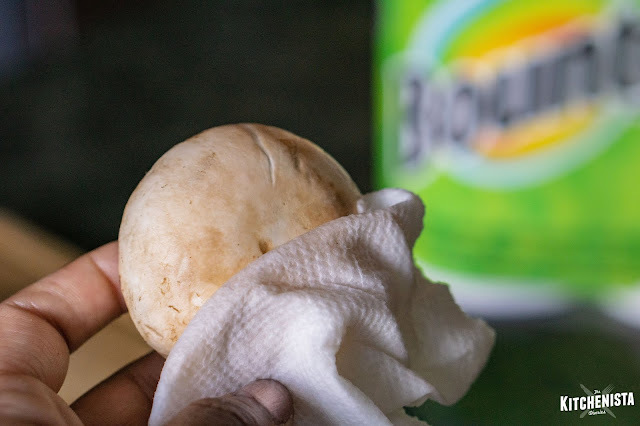 Bounty will also absorb excess moisture and prevent it from rusting. Now your cast iron skillet will be ready to go for the next recipe! Every home cook should have a few tricks up their sleeve for those nights when an easy dinner needs to happen without tasting like you phoned it in. Curry pastes have often been my salvation in this regard, in particular Thai red curry. It's a pantry staple powerhouse, packed with a combination of flavors that manage to transport you across the globe in mere minutes. 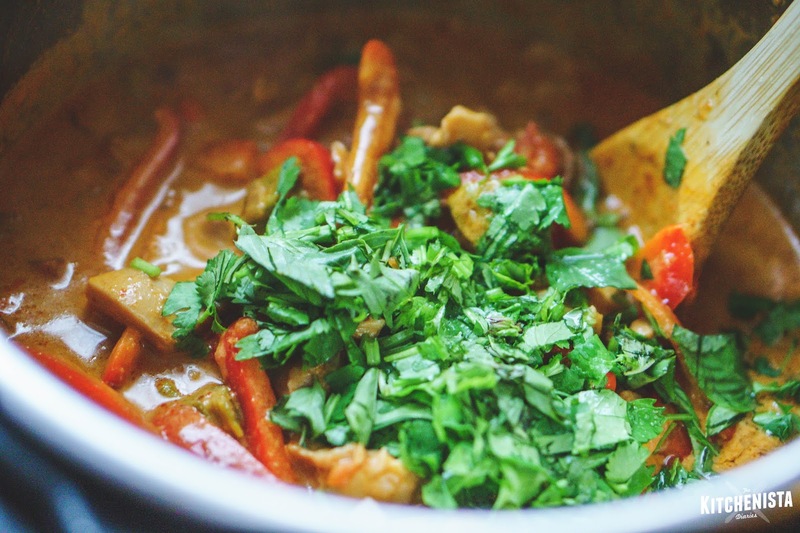 When time allows, I enjoy the adventure in hunting down proper ingredients to make my own red curry paste, though sourcing galangal and makrut lime is where I usually fall short. 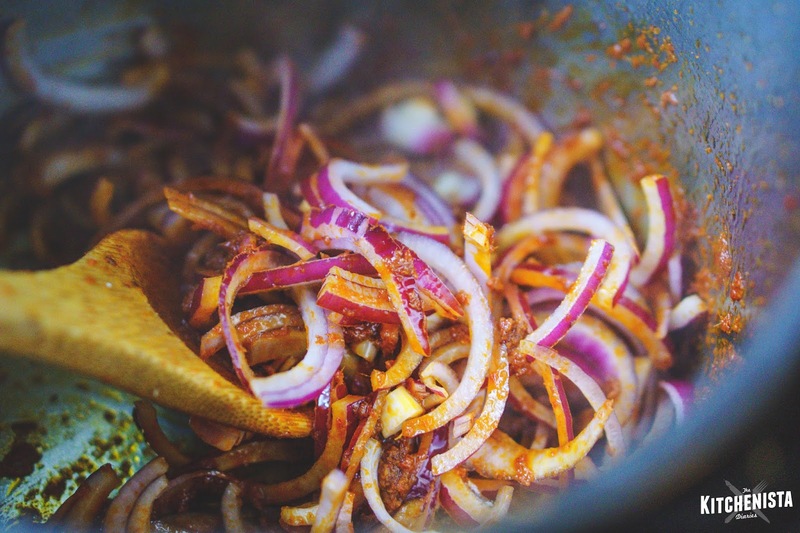 The core ingredients, namely Thai red chiles, shallots, garlic and lemongrass are much easier to find, as are spices like coriander and cumin. Still, these days I've come to appreciate the convenience of keeping a few tins of store-bought Thai red curry paste in the pantry. If you don't see Thai ingredients in your local grocery store, purchasing online is a great option. I've recently joined the Snuk Foods team as a social media consultant and can attest to their massive catalog of international and specialty food products. 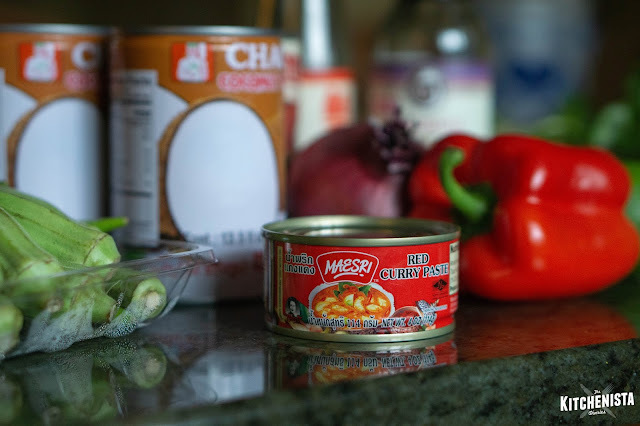 That includes a few varieties of red curry paste, along with the other Asian pantry essentials listed as ingredients below. (As I'm writing this, I did a quick search to confirm they even carry dried galangal!) Snuk's editorial arm, Caravan, is where you can also find quality reading material and recipes, so be sure to stay for awhile and browse the full site. I was thrilled when we added a few Instant Pot recipes this month. One of the wonderful things about cooking curry dishes is how seamlessly the techniques of one country's cuisine can be applied to the curry dishes from another region of the world. 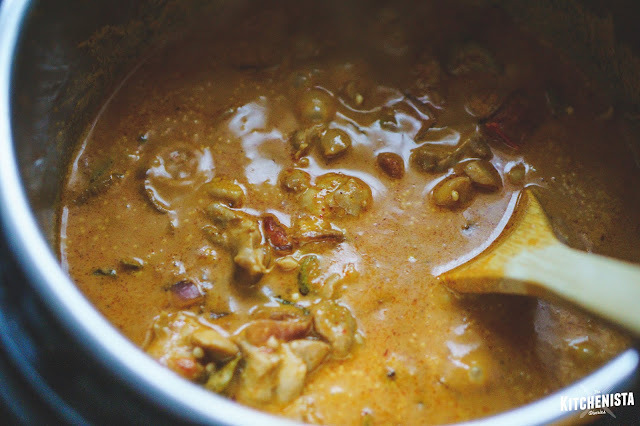 Indian American cookbook author Chandra Ram provided a solid framework for cooking Butter Chicken in a pressure cooker, which I used to tweak my usual stove top method for the Thai Red Curry Chicken in this post. 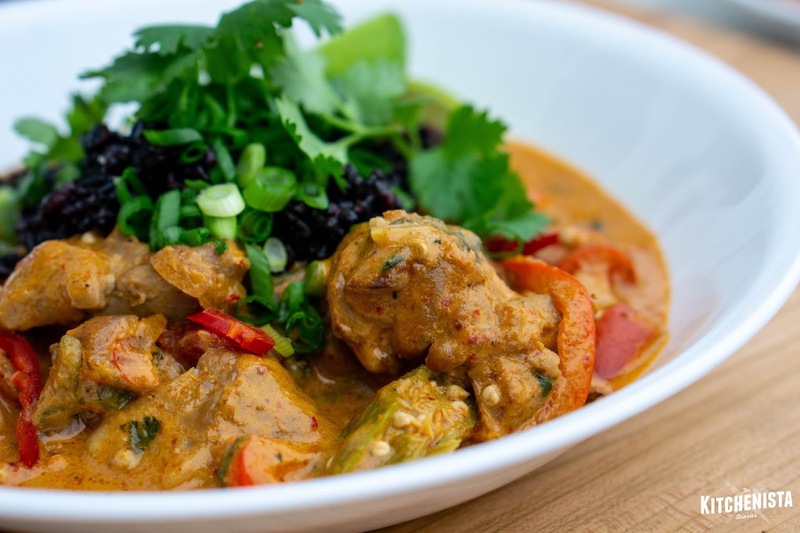 The versatility of red curry paste makes it an easy choice for whatever protein or veggies happen to be in the fridge. Add a can or two of coconut milk and you're definitely in business. In tonight's case, chicken thighs and fresh okra were begging to join forces. Chicken thighs can be braised in a relatively short amount of time over the stove top, but the pressure cooker still manages to cut that in half while producing stewed meat in a sauce that tastes as if it had simmered slowly for hours. 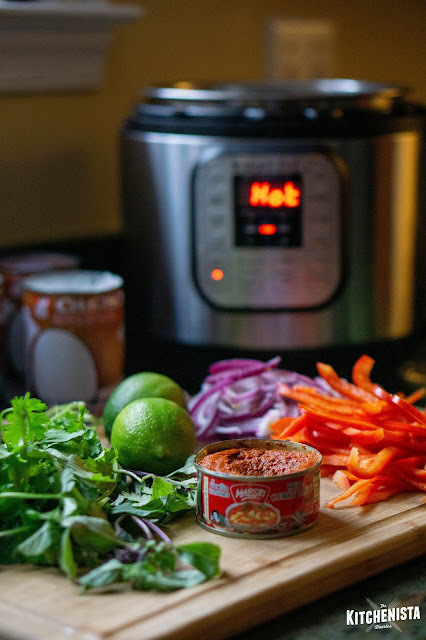 In much the same way that pantry staples save my life on a regular basis, the Instant Pot has also become a kitchen appliance I've learned to lean on. It's not quite "set it and forget it" cooking, however. Pressurized steam can be a bit aggressive for tender vegetables, so while okra is tough enough to be cooked along with the chicken, I opted to add the red pepper just before serving, to preserve its crisp texture. If you modify this recipe with veggies of your own, my best advice is to make that consideration on your end as well versus throwing everything into the pot at once. Curry pastes are flavorful enough to hide a multitude of sins, but mushy vegetables isn't one of them. 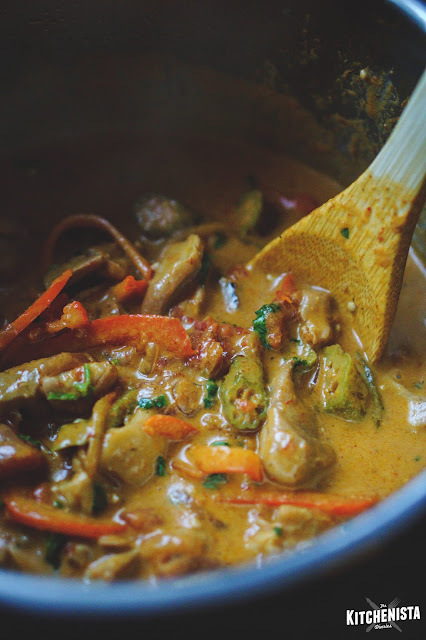 If it's a meatless option you're after, check out my Red Curry Okra and Eggplant post from the early days of this blog. Curry dishes are a treat I can still enjoy when I'm being mindful of my diet. You should always read labels of course, but I haven't had too much trouble avoiding added sugars or even soy. (If you have a shellfish allergy, be on the lookout for the inclusion of dried shrimp.) 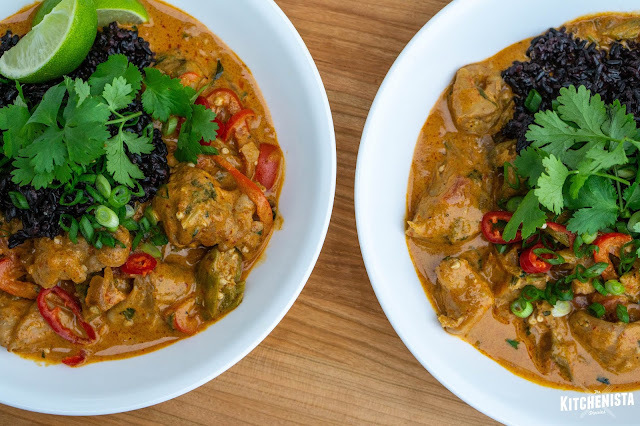 There are few things better than smothering a bowl of steaming hot Jasmine rice with red curry chicken, but that's not to say there aren't healthier things to swap in for the white rice, like riced cauliflower. As I write this post, I'm teetering on the fence of giving up my grains again for another round of Whole 30 in January. In the meantime, quinoa and Forbidden black rice have been in regular rotation, the latter of which was a perfect match tonight. 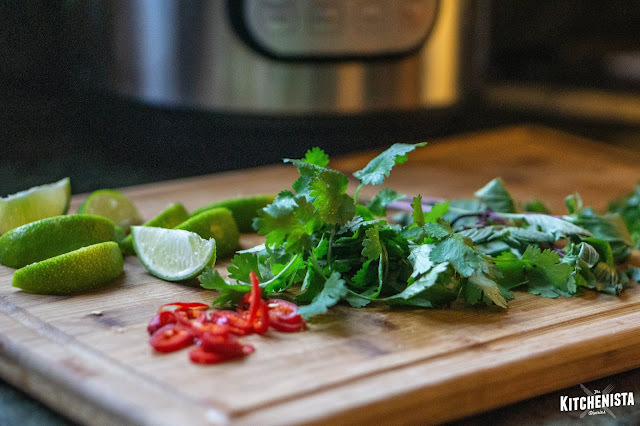 If you can't find fresh Thai basil, the regular variety will do, or omit and use additional cilantro. You may not need a full second can of coconut milk, but it can be used to cook your rice if there's extra left. 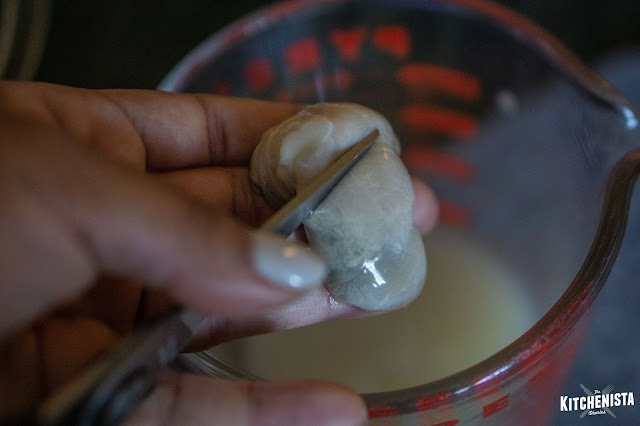 Alternatively, you can adjust the amount of liquid in the pot with stock or water instead of additional coconut milk, however the sauce will be thinner. Set your Instant Pot to the "Sauté" function on high. 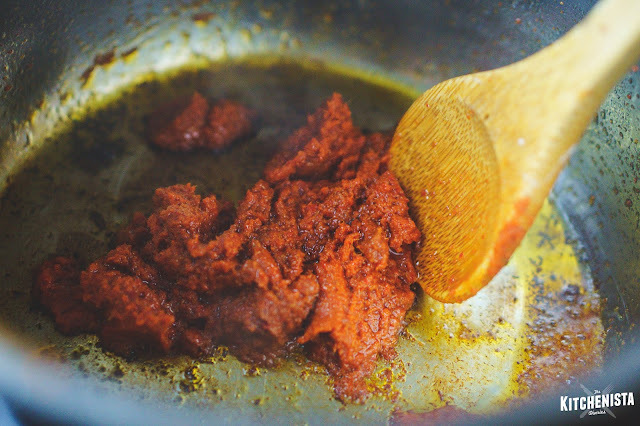 Once the metal basin is hot, add the oil and fry the curry paste for a couple minutes, or until the color darkens slightly. Toss in the sliced onions and stir fry for another minute. I'm always in awe of how fragrant my kitchen gets when curry pastes are cooked. Next, add the chopped okra and cook for another minute, stirring frequently. I have not experimented with frozen okra in this recipe but it should work just fine. 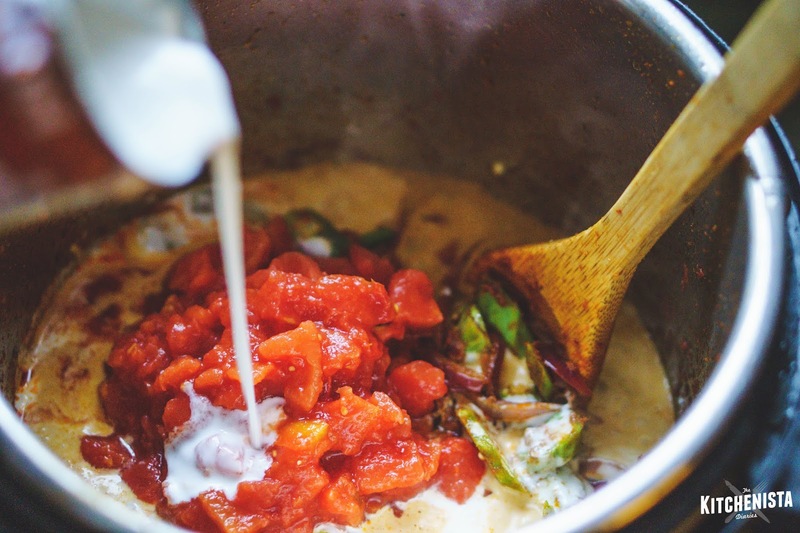 Pour in the first can of coconut milk, scraping up any browned bits at the bottom of the pot. Then stir in the canned tomatoes. Allow the liquid to come up to a gentle boil. Give the sauce a test. Seasonings can vary wildly among curry pastes, so plan to tweak this by taste no matter what you bought. 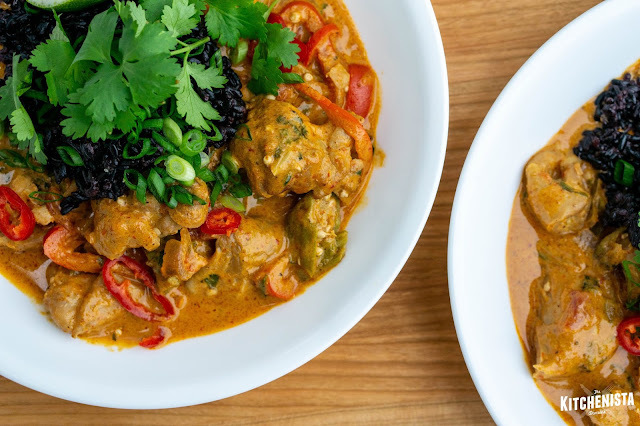 A healthy splash of fish sauce and coconut aminos (or soy sauce) usually adds the right touch of umami and salt to round out a coconut curry sauce. If it's heat you're after, that's also easy to adjust with Sriracha or the equivalent hot sauce. I tend to wait until the end to make that call. The curry will taste more cohesive after it's cooked, so these things can be adjusted then too. Once the sauce is on its way to perfection, go ahead and stir in the chopped chicken thighs. Don't substitute breasts in this case; they will end up a stringy chalky mess after pressure cooking. You want enough sauce to cover the chicken and okra, so pour in the additional coconut milk now, if needed. Close the lid of the Instant Pot and lock it into place. Cancel the sauté function, and set the pot for high pressure, 8 minutes. While the chicken cooks, it's a good time to get some rice going and work on those garnishes. Slice one lime in half to squeeze into the pot later; the remaining can be cut into wedges for serving. After 8 minutes of high pressure, allow for 5 minutes of natural steam release before turning the valve for the quick-release. Turn the sauté function back on high, to give the sauce a few minutes to thicken. Stir occasionally. 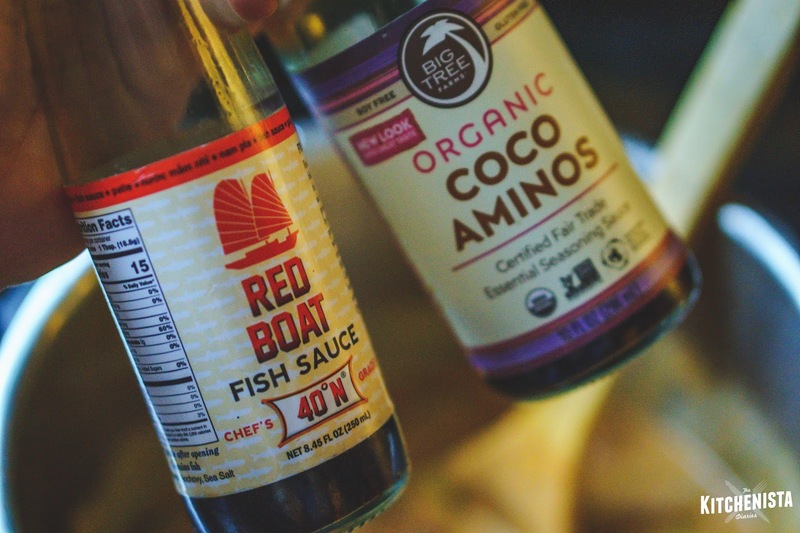 Make any final adjustments with fish sauce, coconut aminos, or hot sauce, as needed. 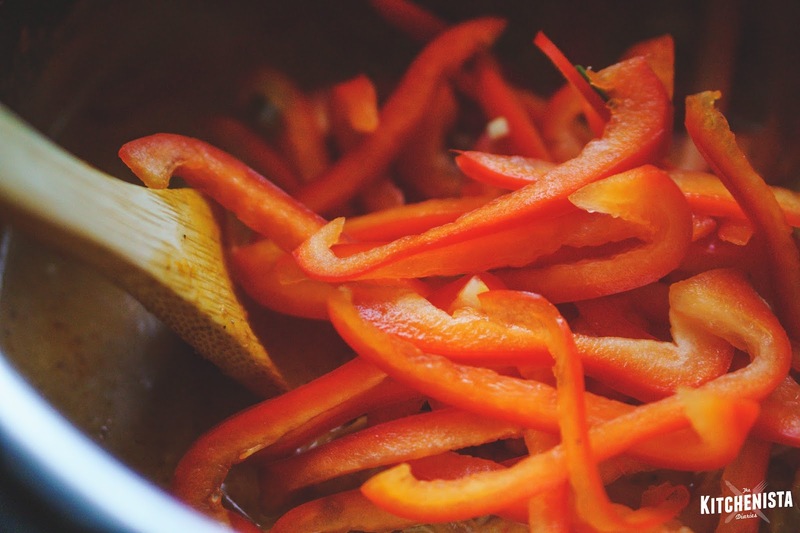 Thin slices of red pepper can now be added to the pot. 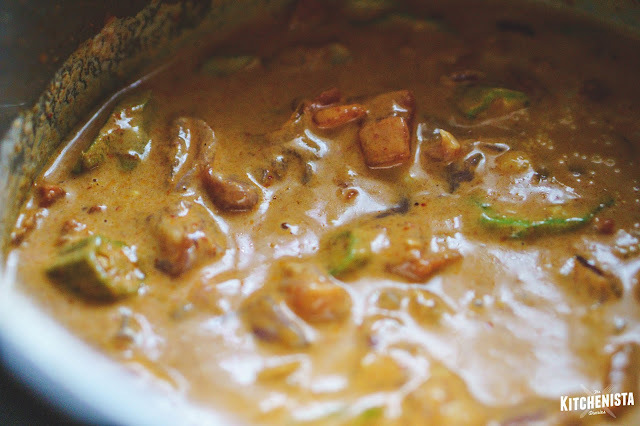 The coconut curry sauce is hot enough to cook them just to soften slightly. Finally, fold in the fresh cilantro and Thai basil, which can be torn into smaller pieces. 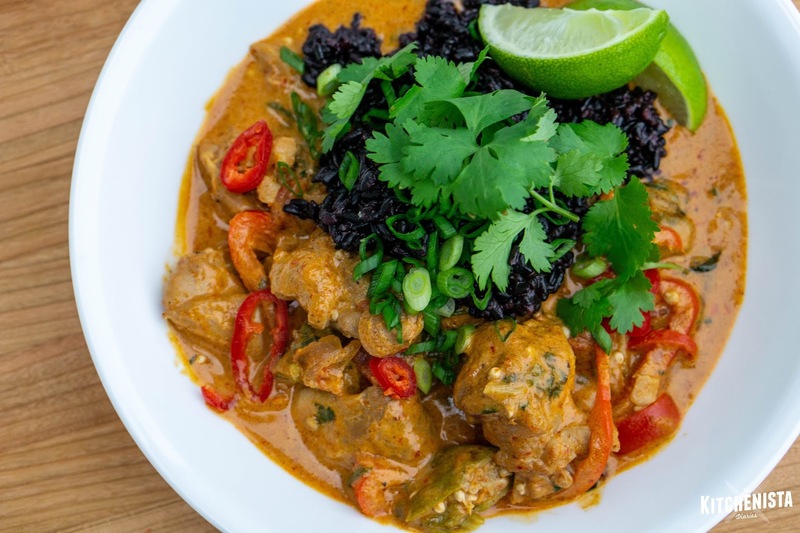 Squeeze in the juice of one lime, for a finishing burst of acid that brightens the rich curry sauce. When ready to serve, the sauce should be creamy and coat the back of a wooden spoon like gravy. 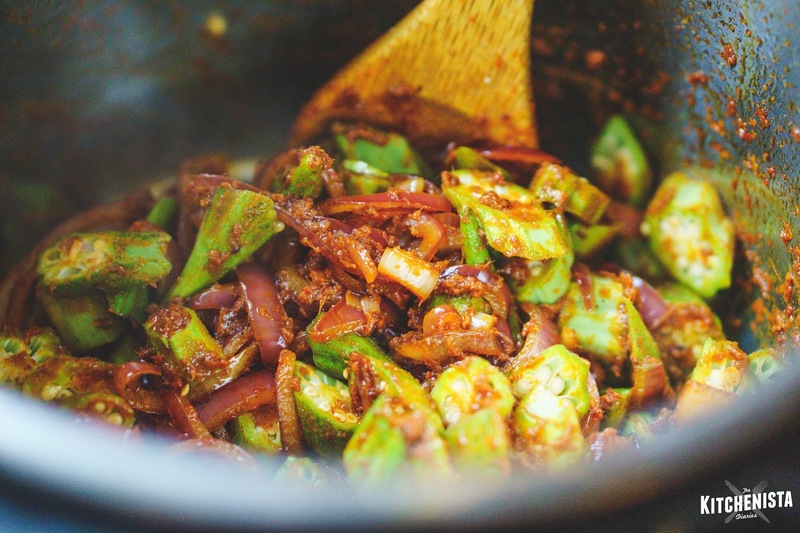 Stewed okra served as double duty here, adding thickening power to the sauce. 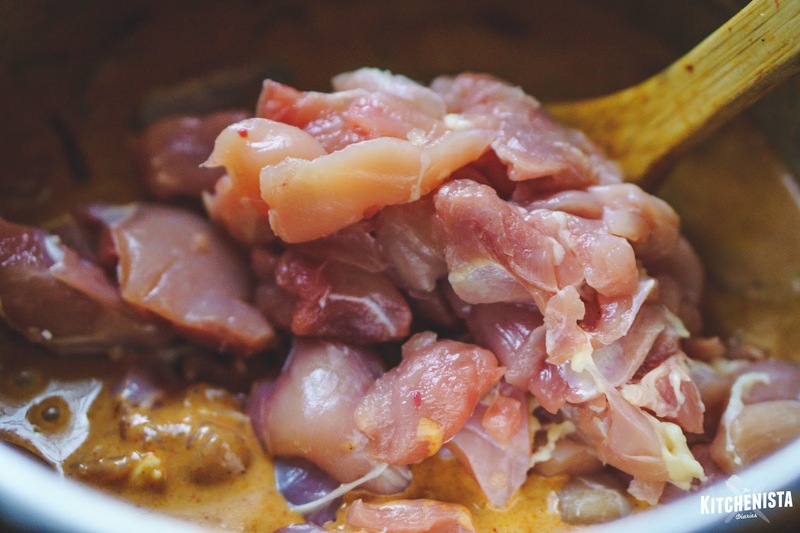 The tender chunks of chicken will hold their shape through pressure cooking, then fall apart with each bite. It's tempting to slurp this up as a soup all on its own, but nutty black rice was calling my name tonight. I garnished with extra lime, scallions, sliced Fresno chili peppers and cilantro leaves. 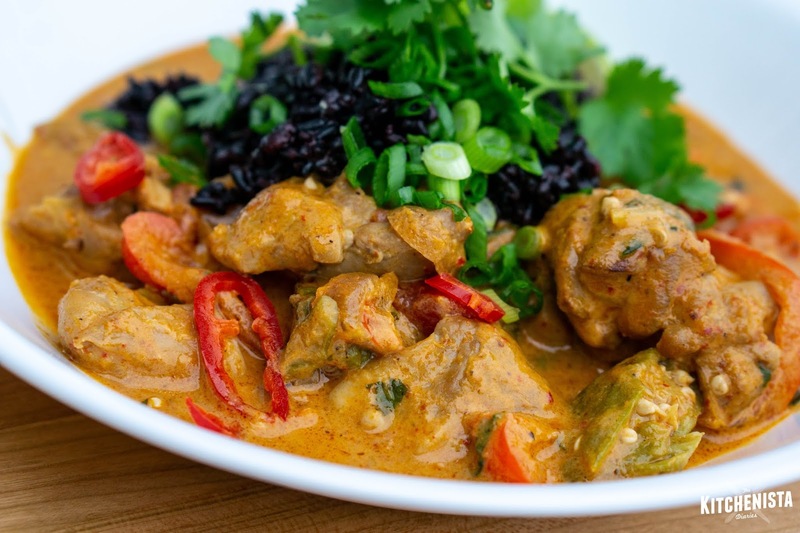 Thai red curry chicken gets bonus points for being a beautiful dish to plate. After running around all week on a hectic schedule, it was wonderful to sit down to a dish that looks (and tasted) as good as something I'd order in a restaurant. Even better news? Thanks to the magic of pressure cooking, this arrived on my table faster than takeout. As you probably know by now, my holiday recipes are conveniently published in a digital cookbook collection! My previous cookbook features all appetizer recipes, many of which will work for the holidays! Just in case you're in the mood for something new this year, I whipped up a couple easy holiday appetizers that you can incorporate into your menus. 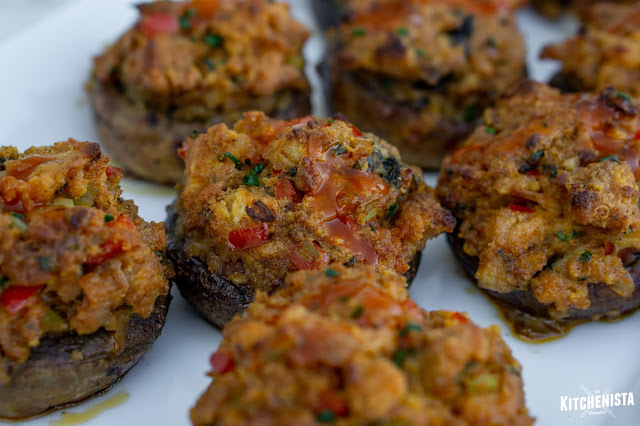 (Look out for my post on Oyster Dressing Stuffed Mushrooms early this week.) Both recipes can be made from Thanksgiving leftovers, so they're also options to make over the holiday weekend to use up those random odds and ends in the fridge. Today's post is one of my favorite sandwiches, converted to crostini form! 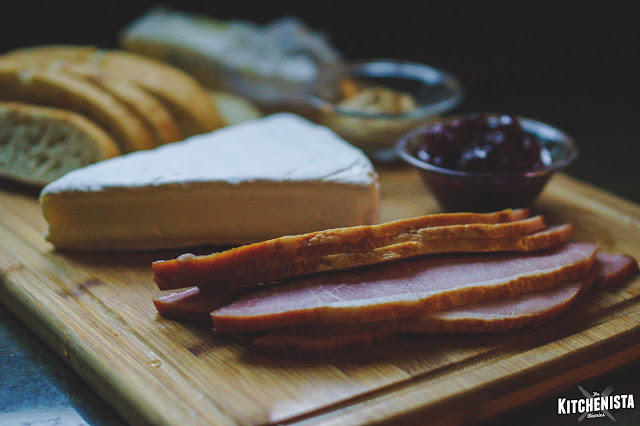 I love a good ham and brie grilled cheese the day after Thanksgiving, made with leftovers from our glazed spiral ham. It has to include some homemade cranberry sauce and a light dressing of mustard to counteract the sweetness. 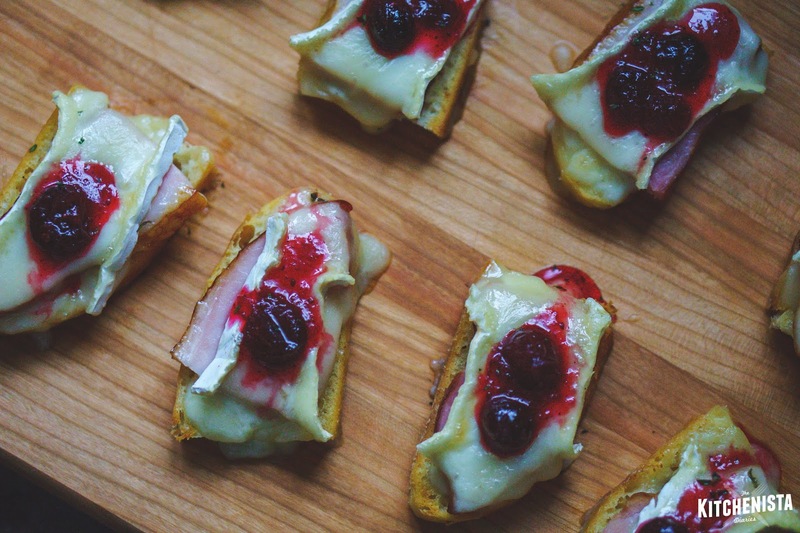 The same ingredients can work perfectly in appetizer form to give your guests the taste of the holidays. 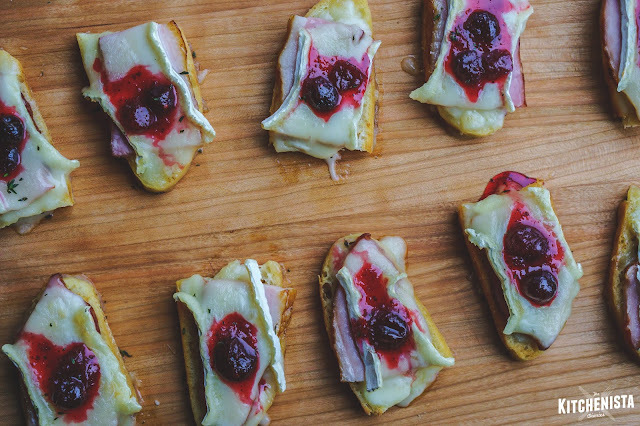 If you'd prefer to use slices of leftover roasted turkey, just swap it out for the ham here. Continue reading below for the recipe! *Note: My Pomegranate Chile Cranberry Compote was used here, found in the Holiday Recipe Collection. Feel free to use another cranberry sauce you have on hand, or even something different like fig jam would work. Add a couple tablespoons of butter or olive to the skillet over medium low heat. 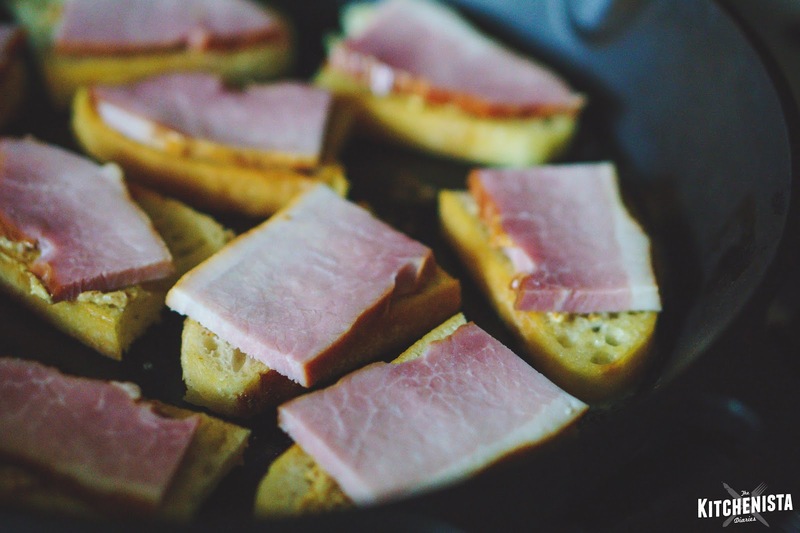 Add the sliced baguette rounds and toast lightly on each side, just enough to see a light golden color. 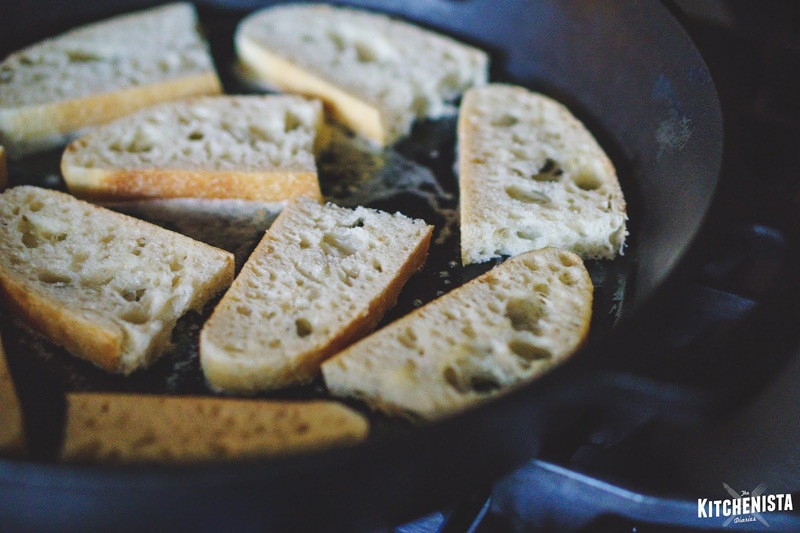 If you don't have an oven safe skillet, brush the bread with melted butter or oil and arrange on a heavy duty sheet pan. 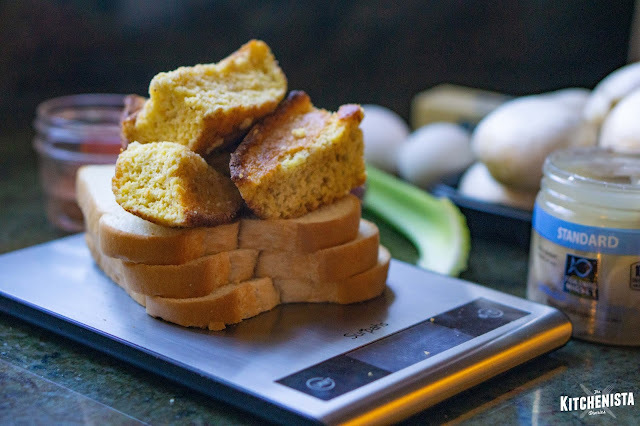 Toast it very lightly in an oven preheated to 400°F. Turn off the heat (or remove the pan from the oven.) 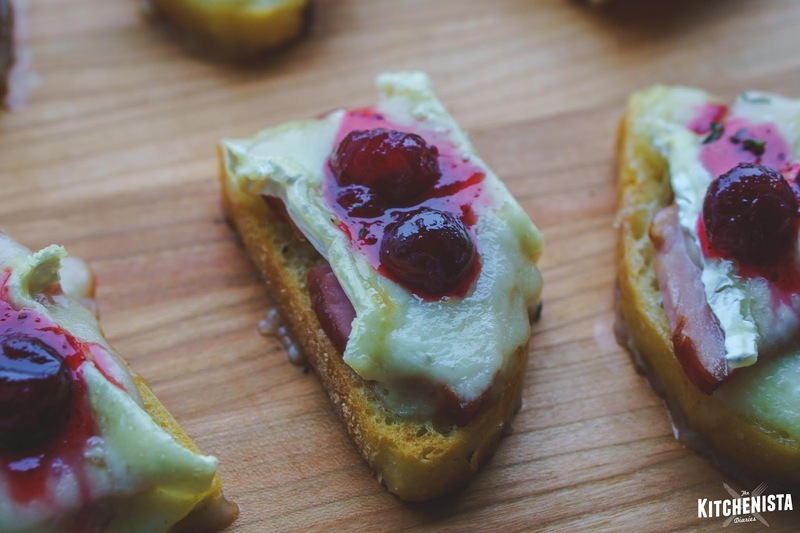 Brush the tops of the crostini with mustard, then top with small pieces of ham. 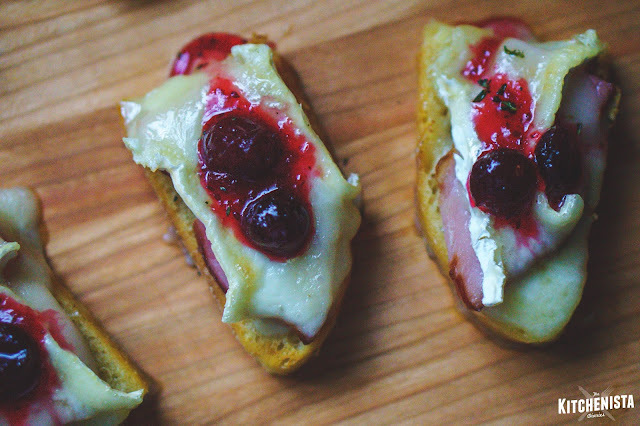 Top the ham with slices of Brie. I included some of the rind, but that's your call - it adds more of the funky flavor Brie is known for. 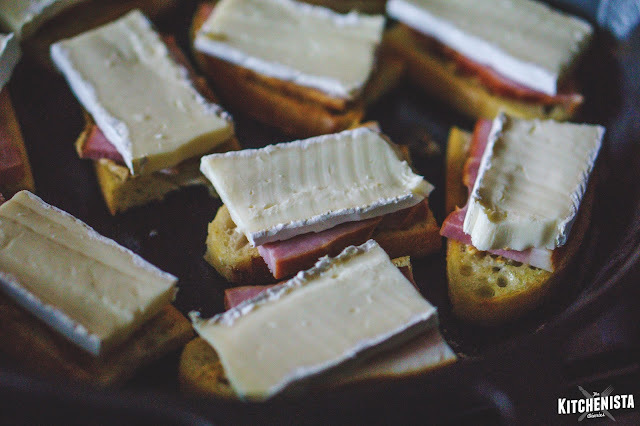 If you chose a really creamy Brie, don't add pieces that are too big because it will melt considerably. Not a fan of Brie? Try shredded Gruyere instead! Preheat your oven to the lowest broil setting. 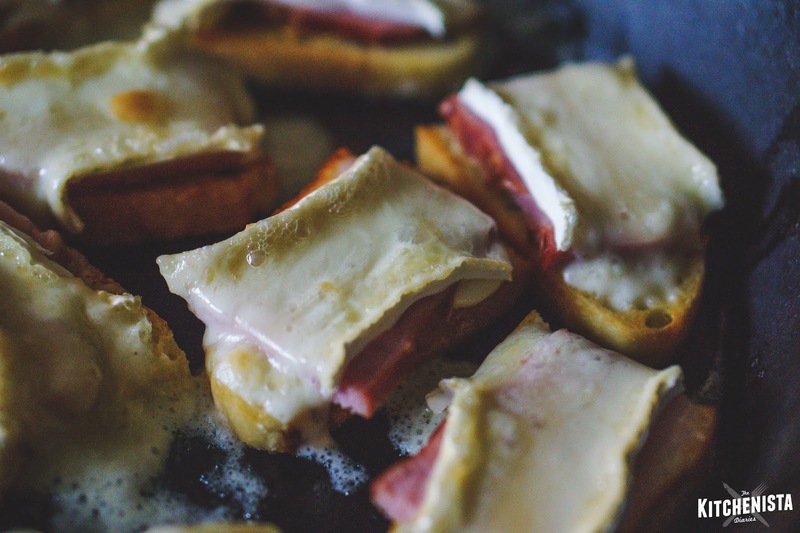 Pop the skillet (or sheet pan) into the oven just long enough to melt the cheese. Keep an eye on it; once the Brie starts to soften this happens quickly. 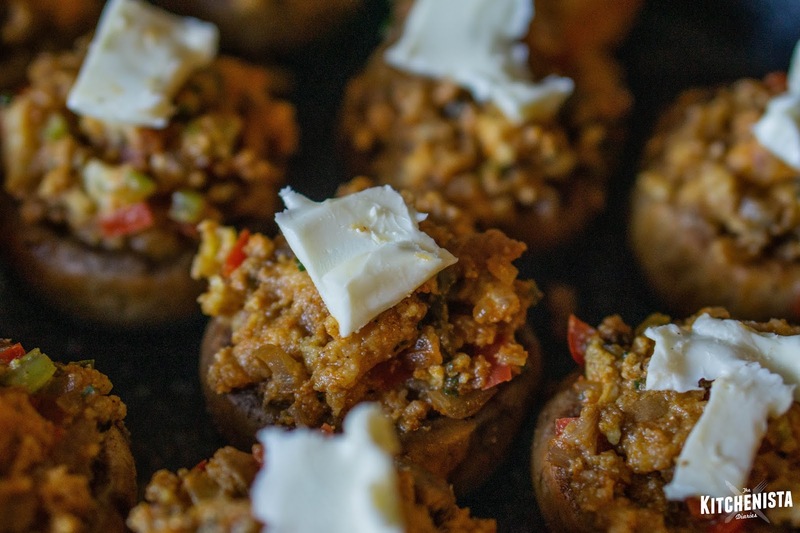 Serve these tasty holiday bites warm or at room temperature!